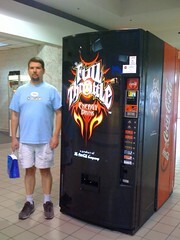 Staunton Mall, Staunton, VA | That Mall is sick and that Store is dead! This is one mall I’ve never been to, even though it’s fairly close to me. Interesting place, by the pictures, it seems. Back in the early 1990’s I was a radio talk show host for Staunton’s ( long defunct ) WSKO 105.5 FM. And even back then this mall had problems. At the time I was with WSKO I believe the mall was known as Colonial Mall and come to think of it I think around 1992 the owners of this mall actually filed bankruptcy. 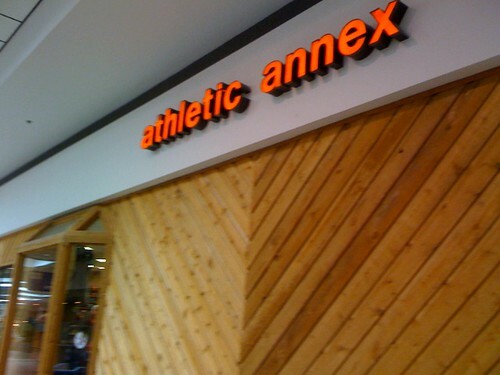 Anyway one thing I do remember about this mall was that it was very very “anti-radio” !! As in for the longest time not only did they not allow the local radio stations to do live broadcasts from the mall ( they may have changed that rule later on )but for a time the stores were not allowed to play the audio from local radio stations on their sound systems ( this was long before retail stores started using some satellite service to pipe in music ). Also Country Cookin had ( still do have one ) a location inside the mall. Back then the restaurant wanted me to tape their commercial inside their mall location but the mall said “No..no radio”. I never did understood that bit of logic. At one point the even refused to allow nearby WHSV-TV channel 3 to do some story on mall property. The last time I was at Staunton Mall ( December 2006 ) I noticed that WHSV at the time was sponsoring some kiddie display in the mall so I guess the mall and WHSV over the years had kissed and made up. i feel that Staunton Mall is pretty wack. The mall is losing more buisness, and before u know it, the whole mall will be empty, just like this town, a ghosttown. There is nothing here for anyone to do or go anymore. Maybe its because I just got here, but I totally disagree with this. There is more here than there ever was in the town I just moved away from. I lived in the area for fifteen years, and Staunton Mall has gone from bust to boom to bust again. When I first moved to the area in 1992, the mall had four anchors: JCPenney, Leggett, Woolworth’s, and FOCUS Montgomery Ward. Then in 1997, the mall got an update and a lot of new stores. Hibbett’s replaced a large food court that only had one tenant. Stone and Thomas replaced Woolworth’s. Will’s opened. The food court relocated to the movie theater. KB Toys moved across the way from its original location. Waldenbooks went out of business. A store called “Fine’s” opened just off the center court. Leggett became Belk. JCPenney remodeled. The mall ceiling was changed from black to white (the black ceiling tile rails are left over from the original ceiling after the tiles were changed). Then in two years, it was back to bust, as Wards closed, Fine’s closed, and Stone and Thomas became the more downscale Peeble’s with only minor signage changes. Will’s became Books A Million and didn’t remodel. Since then, Steve and Barry’s opened and closed, and Belk and Peebles have never seen a renovation or remodeling. Likewise, Steve and Barry’s never renovated the Wards space, instead building their store right over the existing Wards space, which created an interesting look, though it looked like they didn’t bother to remodel the space. 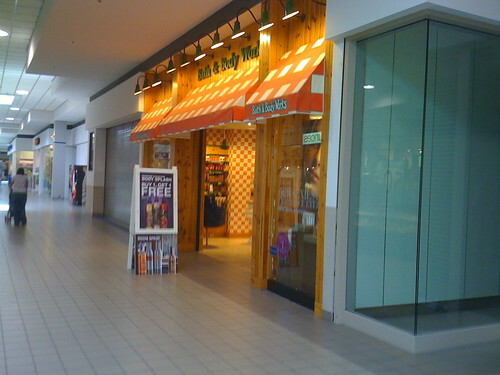 Then Goody’s came and went, having been kicked out of their space in order to have a Gold’s Gym. This mall seems to have very little redeeming value left, and one has to wonder if the time has come for Staunton Mall to ride off into the sunset, with all the new shopping centers that have come about. 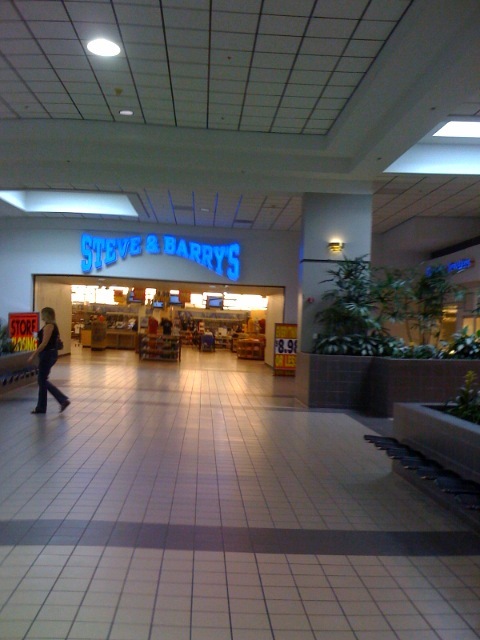 It appears that the Steve & Barrys had some sort of makeover right before they shut down. It looked pretty fresh in the inside. I asked my parents and they can still remember when this mall was first “Staunton Plaza” and was an open-air shopping center. It had all of the popular stores like Montgomery’s and Woolworth’s plus the “happening” Leggett’s. The mall was a popular place to shop until it started to die in the mid-1990’s. The Will’s moved out and Book’s A Million moved in. You have to admit, the Books A Million space never even looked anything like one of their stores. The wooden panelling and green flooring tile never looked quite right. When Steve and Barry’s came in 2004, it seemed a miracle to Staunton shoppers alike. The brand name celebrity clothing lines at Walmart prices made it the coolest place to shop at the mall. Sure, the mall had a few store’s that Valley Mall in Harrisonburg had, such as Maurice’s, Radio Shack, Bath and Body Works, JC Penny, Belk and (at one time) Peebles. But the Staunton Mall has never gotten any of the COOL teen stores like Aeropostale, American Eagle, Hollister, Victoria’s Secret and Pac Sun. Please, STAUNTON MALL, I REPEAT, PLEASE GET AT LEAST ONE OF THE FOLLOWING STORES: Aeropostale, American Eagle, Hollister, or Pac sun. But, I guess the place is alright. The floors and parts of Steve and Barry’s look almost BRAND new. Peebles is still open, but its lame. I disagree with Brandi’s comment that the (down)town is dead. Restaurants open on Saturday night are a good sign. In addition to endless antique stores, there are more interesting places like Pufferbellies toy store. Two functioning movie theaters. Renowned local playhouse. Great parks. Lots of cultural events. And, downtown Staunton is a hundred times more interesting than nearby Waynesboro. The mall, however, needs some love. Great location, but no substantial remodels evident in recent history. I’d love to see it completely redeveloped into a mixed-use center with residential apartments and retail. In response to Cathy’s post – my sister works at a TV station in Charlottesville and tells me horror stories about dealing with the Simon-owned Fashion Square Mall there in town. About how anytime they try to do a story there, they’re constantly bullied by the mall security cops who will not under any circumstances allow them to film inside the mall. I think they even tried to tell the Charlottesville police chief that he had to leave to premesis – which went over like a tin balloon. I don’t understand the arrogance or the logic behind that. It’s not a top secret government facility, it’s a public shopping mall. we were at this mall the weekend before Thanksgiving. At that point, Steve and Barry’s was open only in order to sell their fixtures. There wasn’t a thread of clothing left in the store. While it did, indeed, look new, a closer look clearly identified the building as a former Montgomery Ward. Having never had the opportunity to be in a Peeble’s before [and I have visited many department store in fifty years], I quickly decided a visit to another Peeble’s wasn’t something I would go out of my way for. If there was any upscale ambience to the store when it was Stone and Thomas, Peebles stripped it away. Because we had parked outside Belk, we were required to go in there twice. What a depressing place! Dark, dingy, and foreboding, it seemed as if the ceiling was going to mash you in the head before you got out the door. Penney’s was in about the same shape, and it seemed as if perhaps at some point in time the store had been chopped in half and a fake wall built to hide the extra space. I could be wrong about this, but I have never walked in the mall entrance of a Penney’s and be able to see the back wall from the front of the store. A trip to downtown Staunton, however, was totally different. On a Friday afternoon, the streets were crowded, parking was somewhat hard to find, and the stores were doing a great business. This was great thing to see…and while downtown Staunton will definitely still be there the next time we go [and we definitely will], I can’t say that it would surprise me to see bulldozers in action…hopefully building something to replace the current hallway of retail neglect. This was originally an outdoor mall that had been converted in the 1970’s sometime. I actually remember the record store in that mall. I think I bought a cassette of the third album by The Nice there (Keith Emerson’s pre-ELP band). I lived in Staunton most of my life, until 1981, and remember the old outdoor mall when it was called Staunton Plaza. The anchors were Montgomery Ward, JC Penney, Woolworth, and the Plaza Cinemas. When it was enclosed in the mid-90s, Belk was added along with a dog-leg promenade down in front of the old Wards (now Steve & Barry’s). The mall and the skating rink behind it, Skatetown USA, were the few places in addition to Gypsy Hill park where us kids could hang out. It was the age of Disco, Star Wars, and Jaws, and no one complained about our loitering around. The pet shop and lunch counter inside Woolworths was a favorite of mine. You could smoke, cigarettes and other things, outside on the brick planters and not get harrassed. When I returned in the mid-90s for a visit, WalMart and Lowes had taken hold in the area, and I knew it was a matter of time before the mall died. As a side story, Walmart started in one place a half-mile up the road, abandoned it for the site across the mall a few years later, then abandoned it yet again for Richmond Road, an adjacent arterial that attracted more shoppers from Waynesboro and Fishersville. 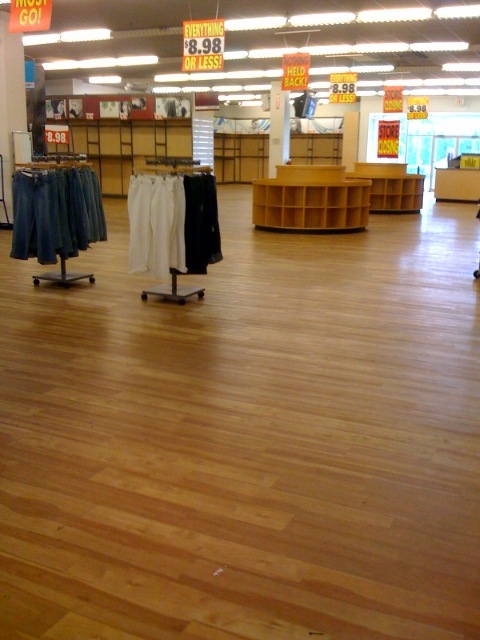 In the process there was left several abandoned big-box stores. I’m surprised the Staunton Mall is still in existence, since everything they sell can be bought cheaper at local Walmart and Target. Most people in Staunton who shop malls are on fixed income, or low income (blue-haired old ladies and other very politically conservative folk that don’t have much value for downtown). They don’t frequent the downtown shops, as that is reserved for the liberal college students, professors, and recent transplants with plenty of money looking for that quaint Victorian town where they can afford a $15 lunch at the bistro, or a $5 tomato at the Farmer’s Market. In my opinion, the revival of downtown Historic Staunton is the best thing that ever happened to that town, even though it might not serve the socioeconomic needs of most town residents. The mall should be demolished, leaving stand-alone anchors like Belk, Penny’s, and maybe a Sears or Best Buy, in an open area mixed with restaurants and small shops, like has been done at North Hills Mall in Raleigh, or South Square in Durham. Both have seen an incredible renaissance. You have convenient access to parking, but with a much more pleasant atmosphere than being trapped inside a faceless and sterile enclosed space. Without the anchor department stores, the site has little to no value as a shopping destination. It could end up being a dining and entertainment destination with bigger cinema and a few more casual restaurents like Outback. Another reason for this mall’s demise is the improved shopping in nearby Waynesboro. They have a new Target and Home Depot (I believe), so they complement Walmart and Lowes whereby most shoppers get all they ever want or need, in a clean and modern suburban environment. They don’t need to drive down the road another 5-10 miles to shop in their sister city. Folks in Waynesboro were alway jealous of Staunton anyway, and folks in Staunton aren’t all that friendly either. I too remember when it was an open air mall, there were sunken places in the middle with seats and these weird concrete painted “animals” that kids could sit and climb on while their parents sipped a drink or waited for their ride. I remember when Santa came, he was in a little wooden house, about the size of a small bathroom, and you went up the steps into the house, and sat on his lap for a few minutes. Very nice! Such a shame that the mall has seen such hard times. I remember when the large food court was first opened, the place seemed to be booming then. And a few years later, only the hotdog/burger place was left. I remember back when the Staunton mall wasn’t that great but it was still better than what it is today. I use to practically live at that mall. It always seemed to have a certain life to it even when it was dead. My friends and I came to the conclusion that it’s like the big, ugly family pet: no matter how much you want to hate it, you can’t. I’d love to see them put in some new stores and get business going again. Nobody wants the family pet to die. The mall wasn’t half bad in 2008 until early 2009. I spent alot of time there, especially in Hibbitts, Athletic Annex, Roots and Music, and in Books a Million. Recently though, one large part of the mall, with an exception of about two shops and Belk, has become a ghost town. Several small shops come and gone within the span of only a few months, and other stores are begining the process of either relocating or going out of business. If the Staunton Mall wants to stay in business it should have more stores like Hollister, Urban Outfitters, American Eagle, PacSun and Abercrombie & Fitch put in. Alot of the younger residents of Staunton and nearby Jollyvue, Mint Springs, and Greeneville shop at those stores and travel out of their way to other cities such as Richmond, Charlottesville and Harrisonburg just to buy clothing. Itd be so much more convenient, not to mention save lost of gas and money, if people in this area could buy the things they like here. Itd also help the Mall revive itself and make more money!! Lets face it, young people do not wear the things sold in the Staunton anyway. The merchandise offered in its stores are made for older men and women. Even at Maurices all of the clothes are either unflattering or very VERY large. Not stylish at all. Ontop of all this, in the center of the mall where most of the traffic takes place, construction is going on. No joke, there is only 3 feet, on either side of the blocked off area, for walking. Plus areas removed of tile sticking out from the construction makes it easy for someone to trip if they were to not pay much attention to the ground. Im thinking the mall is putting in a fountain or something from the looks of things. Other wise theyre just replacing the old cracked tiles. If I were you, I wouldnt even bother wasting my gas or time on the Stauton Mall unless I wanted to buy sporting goods, chinese food, or cheese fries. There are a lot of locally owned business. High comand is a must go to. They have a tattoo shop in the store. Think of a store pink Floyd and Bob marley would have open togher with a Spencer twist. This is the best store of its kind I have seen. They have a lot of clothes along with black light posters hats ,along with braclets and necklaces. One of the most unique aspects is that the lighting is all Black Light. Which makes it feel like you were thrown back in time. Or are at a rave a good rave. Minus the drugs. The store is a one of a kind come check it out. We first went to Stanton mall sometime around 1988, we had all come down from Frederick MD to go to an SCA event in Charlottesville, we crashed overnight in Waynesboro and while driving home we all decided to see the first Teenage Mutant Ninja Turtles movie there. So here we are, about 12 people, first show Sunday morning, in medieval clothing watching previews, to which i stated a little too loud “what we need no in a room full of 8 year olds is a preview for an R rated movie, the theatre did not dissapoint in showing the preview for “The Adventures of Ford Fairlane” which shocked so many parents. I grew up near Staunton in the 70s and 80s and as a kid my folks would take me to then Staunton Plaza. For a rural boy that was a big deal! So much stuff all in the same place! I have vivid memories of going to Woolworth’s to buy candy and toys – especially the new G.I. Joe toys, plastic and vinyl Halloween costumes, and Razzles. Penny’s was at one end and Leggett’s at the other. Back-to-school shopping was an annual ritual and always done there. I remember Leggett’s when it was downtown, then they moved to the Plaza, or did it combine with the location at the Plaza? Montgomery Ward was also a common place to visit for tv’s, furniture, cookware, etc. Also the record store which was near the Leggett end, and a toy store which I think was near the Penny’s end. Back then the biggest competition I recall was probably the Kmart just down Greenville Ave and the department store (I’ve forgotten the name) over on W Beverly St (now Chestnut Hill shopping center with a Big Lots and Family Dollar; I remember a drug store most certainly, and maybe a hardware store as well; at some point it became a terrible flea market before closing completely). Staunton Plaza/Mall has changed hands so many times over the decades that I can’t keep track. I do remember when it was enclosed to create the Mall. The central feature of the new Mall was a big fountain. That didn’t last long. I vaguely remember the movie theatre not being with the original Plaza but added at some point. I think it was added during the renovation to the mall format? Kids don’t pay much attention to things like that. At present (2015), the place is awful. Someone above commented that the mall has failed over time to draw and/or retain recognizable stores, and that’s true. Also it’s gotten killed by competing, more modern construction. The Kroger strip mall got built down the road. Right across Greenville Ave and up on the hill was some big box store I’ve forgotten the name of. Then Walmart came in. Then Martin’s, and so on. Plus it’s not that big a deal to cruise over to Waynesboro or Harrisonburg, or even Charlottesville or Roanoke to do your big shopping trips any more. However there are a few things that might keep Staunton Mall going and even revitalize. Penny’s is still there and seems to be getting by. The mall also has a gym now, and it’s getting a Crossfit affiliate. Sorry this place needs to be repaired or rebuild a new mall. I went to the Hot wok to get some spicy chicken about 4 months ago. As I was waiting for my food I went to the bathroom near the old closed movie theater where we all enjoyed many movies and had to dodge the trash cans placed in the middle of the floor to catch the water fall from ceiling. So many good memories of this place but it’s hard to watch the miss management and decoy of a once loved place of many people. I found out about this website from newspaper article in Stuanton Newsleader which spoke of it. Hopefully this new management company can live up to what say because you wouldn’t believe what this place looks like since you were last there. If you would like photo just reach out to me and I’ll go there the next time I’m off. Sorry to say it’s even more moribund than the last posting suggested. Lots of empty spaces, though I give the owners some credit for bringing in sports activities and hobbyists. Still has 3 anchors — Belks, Peebles & Penney’s — but all 3 carry smaller inventories than in the past. Lots of deferred maintenance, too — leaking ceilings all too common. The retail base is not only reduced by competition (Kohls & Target opened a few miles away), but the axis seems to be shifting from South Greenville Ave to Richmond Road, and new shopping centers near I-81 may finish off the mall unless they come up with creative approaches like the ideas mentioned in your article.